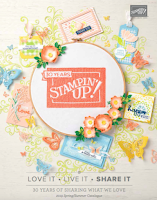 New month means new Stampin'Up! Special Offer, and what a super offer it is. 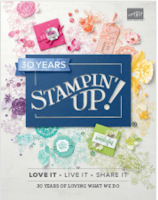 If you own any Stampin'Up! 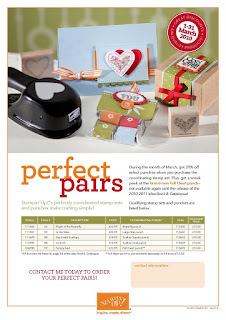 punches you would be very excited by THE PERFECT PAIRS offer. Click on the picture below to make it bigger and to see the sets on offer. For the whole month of March you can purchase a selection of stamp sets and get the matching punches for just £10 a fab 20% off the original price. But that s not all if you look closely you will see a brand new punch design the big love heart, now this will only be available for this month only or until stock last so you will need to be quick because I know is going to go out of stock pretty soon. I have already placed my order and cannot wait for it to arrive and if you want to get yours email me today to order yours and make sure you don't miss out. And as if by magic the last class I designed for Stamp With Us uses the wonderful Flight of the Butterfly set and the matching punch. I used shades of pinks (Pink Passion, Pretty in Pink) and orange (Pumpkin Pie) grounded with a touch of Chocolate Chip. The lovely box houses 8 little 4"x4" notes and the top was decorated with a medley of butterflies pearls and fleurettes those wonderful crochet flowers. 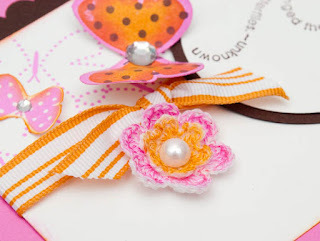 Monica, I love the card box set it is so pretty, the colours look beautiful together. Another gorgeous gift to give to a special friend!! Monica thank you for leaving me such a lovely comment on my blog. It means a lot coming from a talented person like yourself. Your cards are amazing and very inspirational.